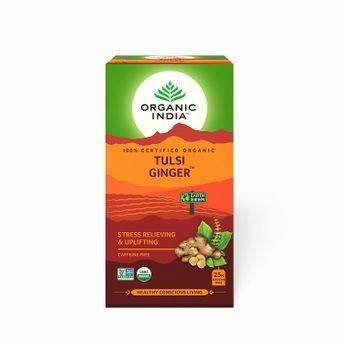 An unique and all time favourite Tulsi Ginger combines the anti-stress and immune supporting properties of Tulsi, with aromatic smell and amazing qualities of Ginger, traditionally used to activate the body's fire element, to burn up toxins and improve digestion. Ginger is known to have the ability to calm an upset stomach, promotes the flow of bile and helps to minimize the symptoms of colds and allergies. Tulsi Ginger is a delicious indulgence any time.